Although this was my first time in Mexico, I felt at home almost immediately. It felt like home even though it was a completely new place filled with different people, sights and sounds. I think it’s because Mexican culture evolved in a similar way to ours here in South Africa. Mexico, like South Africa, is a melting pot of multiple local tribal cultures as well as European, Middle Eastern and Asian influences. There is poverty and therefore crime, but in spite of these struggles there is a genuine sense of warmth and national pride from everyone you meet. 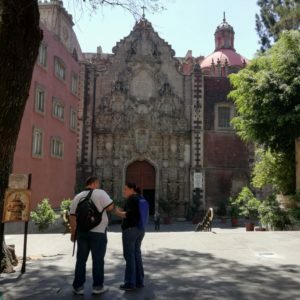 As you are probably aware, the main European influence in Mexico comes from the Spanish and besides the language, one of their biggest contributions to today’s Mexican culture was Christianity. 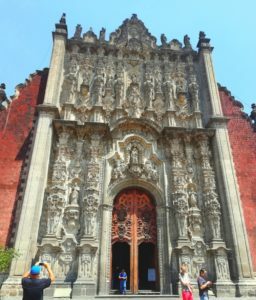 There are churches and cathedrals all over Mexico City – the majority of which are ornately decorated spectacles all to themselves. One of the ornate façades of the cathedral the Zócalo – the main square Mexico City. 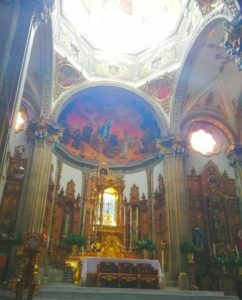 The altar within the Church of San Juan Bautista in the suburb of Coyoacán. 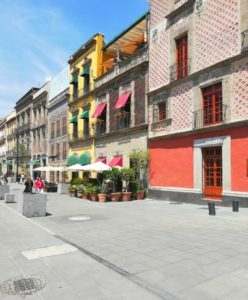 A side-street near the Zócalo with beautifully preserved architecture. Another spectacular building, just a short walk from the main square of Mexicao City, is the Palacio de Bellas Artes. 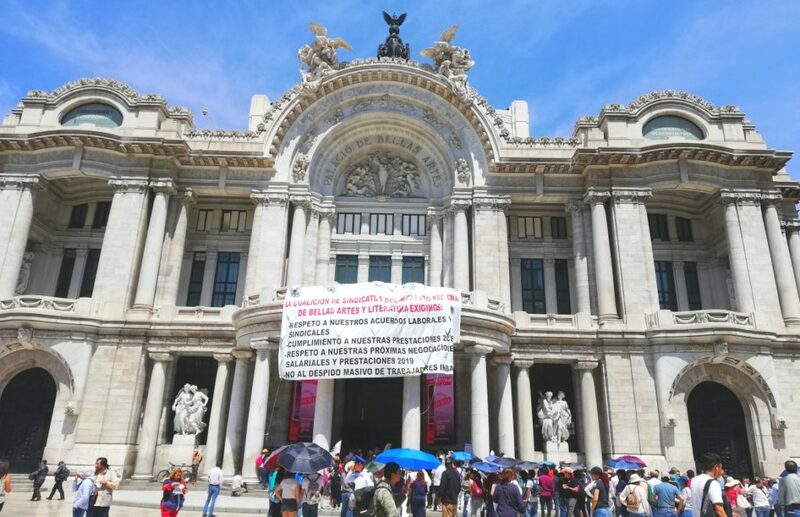 Replacing the National Theatre of Mexico, it is an extravagant white stone building in a combination of the Neoclassical and the Art Nouveau styles that took 30 years to build. The inside of the Palacio de Bellas Artes is just as magnificent as the outside. The internal architecture is in the art deco style which includes references to local tribal cultures by including allusions to water and nature and carvings of Chaac – the Mayan god of rain. Inside the theatre itself, the grandeur continues with stained-glass installations and an impressive crystal and brass curtain that weighs tons, but can still be raised above the stage when it is time for a performance. The imagery on the curtain shows the volcanoes Popocatépetl and Iztaccíhuatl in the background. In the foreground, you see vegetation from the different biomes in Mexico; going from the desert to the more forested areas as you look from left to right. Frida Kahlo and her husband Diego Rivera actually attended the grand opening of the Palacio de Bellas Artes. 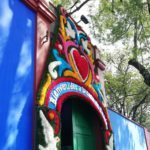 It was interesting for us to hear as her artistic works and themes have become so synonymous with Mexico and Mexican culture – a lot of the options in most of the gift shops at the tourist destinations either directly use her works or are inspired by them. 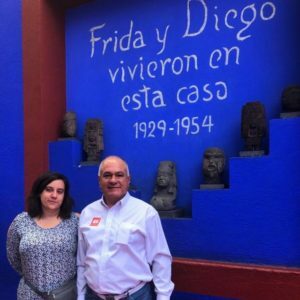 We were lucky enough to visit Frida’s house later on in the week to see where she created her works. It’s magnificent – cobalt blue on the outside and bright and filled with yellow on the inside. Half of it has been converted into a gallery to show off some of her paintings, but her studio, dining room, kitchen and bedrooms have been preserved as she left them. You can even see where she had affixed a mirror to the canopy of her bed to paint a self-portrait when she was bed-ridden near the end of her life. She had a tough life; she had polio as a child which left her with one leg shorter than the other, she hit by a streetcar at 18 which left her with life-long pain and other medical issues, she could not have children although she had wanted to be a mother and she had a turbulent marriage which sadly seemed to mirror that of her parents’. It is heart-breaking to think that she experienced so much sadness, suffering and loneliness in life when her works provide so much happiness and pride in Mexico and its traditions. It is a reminder that, even if you can’t see it at the time, work that you put your soul into can have long lasting effects on others. I hope you have enjoyed this little whirlwind tour of Mexico City as much as I have enjoyed reminiscing on the trip to share with you.